Range Rover Sport TDV6 remapping in Leeds. Our mobile engineers visited this customer for the Range Rover Sport Remap at his home address in Leeds. The Sport was released from the Range Rover factory with the 2.7 litre diesel TDV6 engine in 2008 producing around 190 BHP and 440 nm of torque. While the Range Rover Sport is a great car, known for it's reliability and great off road performance owners can often feel a little undersold with it's performance and numb trottle response. Remapping the Range Rover Sports engine ecu tweaks the engines components and ecu parameters to give a much improved throttle response, more torque, more BHP and a much smoother driving experience resulting in fewer gear changes, smoother acceleration and a nice saving on fuel. Post Range Rover Sport remap you can expect gains of 50bhp and 80nm in torque, taking figures to 240 and 520 respectively. Safe & Sound Vehicle Systems offer a 14 day money back refund should you find your are genuinely not happy with your remap carried out in Leeds. If this is the case we will happily remove our remapped software from the Sports engine ECU and relace it with the factory software. 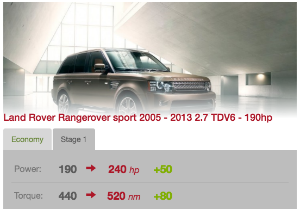 We have to say though, we have never refunded any Range Rover customer after a remap...! Should you wish to enquire or book your Range Rover Sport in for and engine ecu remap in Leeds then please feel free to contact us.